It was easier to go on couple-only trips when we only had one kid. The awesome Mum-in-law (and the late father-in-law) had no problems taking care of just one. Ever since we had our boy, we have never travelled without our kids any more. We always have to bring along at least one kid with us because the Mum-in-law wouldn't be able to handle two kids under 5 years old alone. Don't get me wrong, it was and still is a privilege for us to still be able to travel even with two kids. However, our focus was always on the kids, so much so that the hubby and I started to neglect each other. 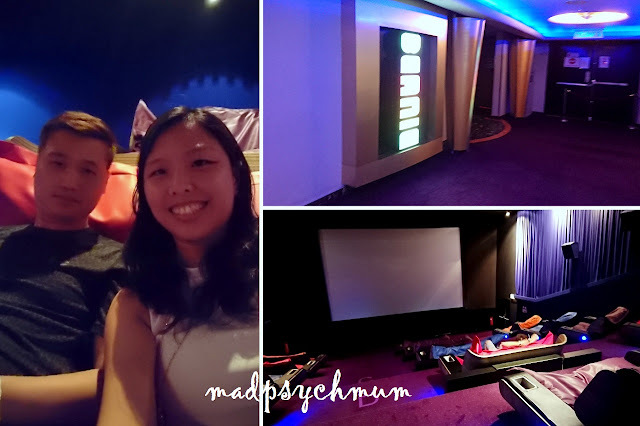 Now that the kids are old enough to feed and clean themselves and therefore are easier for the Mum-in-law to handle on her own, the hubby and I decided that it was time to go on our first couple trip (3D2N in KL) since having our boy so that we can reconnect. We got so much love and support from everyone, especially fellow parents, who knew what a luxury this was to us! We flew by Singapore Airlines to Kuala Lumpur International Airport and took a taxi to our hotel. 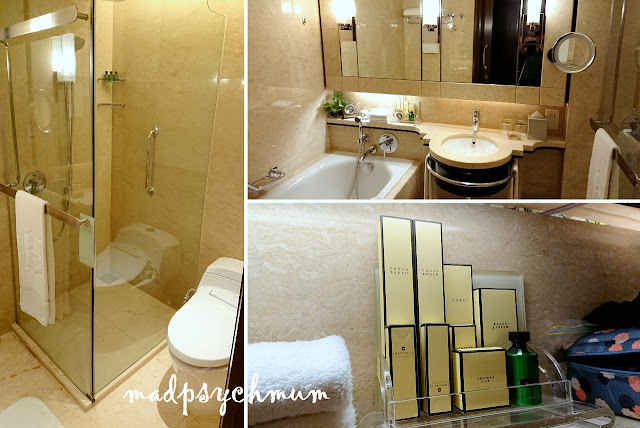 We stayed at the Horizon Club at Shangri-La Hotel Kuala Lumpur. They were having a good deal for their club rooms so we booked the Horizon Club Executive King (with Breakfast and Afternoon Tea) at S$254 per room per night via Agoda. Very big and comfy bed that I did not have to squeeze with my kids! Wardrobe with iron, bathrobe and even an umbrella. 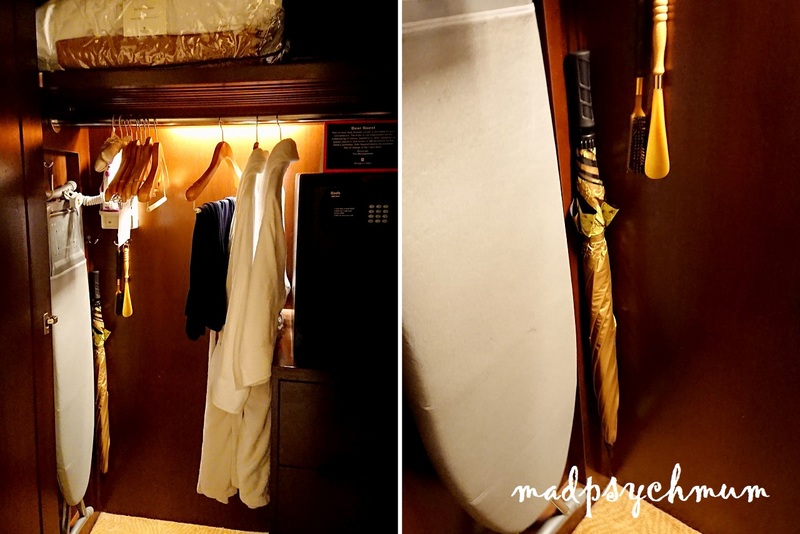 The umbrella proved extremely useful whenever it rained in KL! We had breakfast every morning at the Horizon Club. 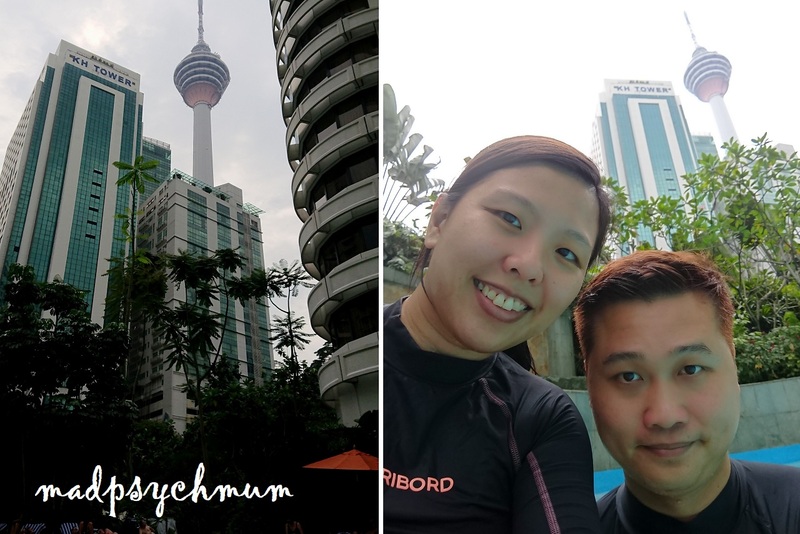 On top of the usual buffet of the usual breakfast food, we liked that they also offered made-to-order food items such as Roti Canai, Nonya Laksa and eggs done just the way you like it. The only time that we had to eat lunch was on the first day that we arrived (no buffet breakfast in the morning you see! *laughs*). We were too lazy to explore other eateries and decided to try Shangri-La's own restaurant at the ground floor. Most of the patrons opted for buffet but we decided to go with ala carte as we prefer quality over quantity. Can't remember what this dish was called but it was so good! Ordered their signature burger, which was so sinful!! We enjoyed both dishes! So yummy! As Horizon Club guests, we were also entitled to afternoon tea served from 3-6pm daily. We got to choose from a wide selection of snacks and pastries! My selection, with a mix of different desserts that I love! 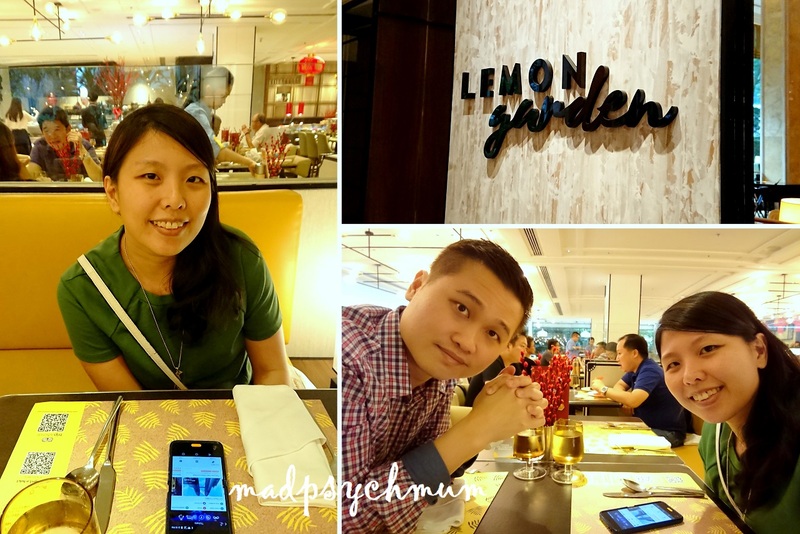 The hubby Googled for popular eateries located nearby in search of our dinner and found BBQ Nights, just a 5-minute walk away. I think this was the fish and prawn platter. Very yummy! We also tried Madam Kwan's at Suria KLCC on the last day of our 3-day trip. 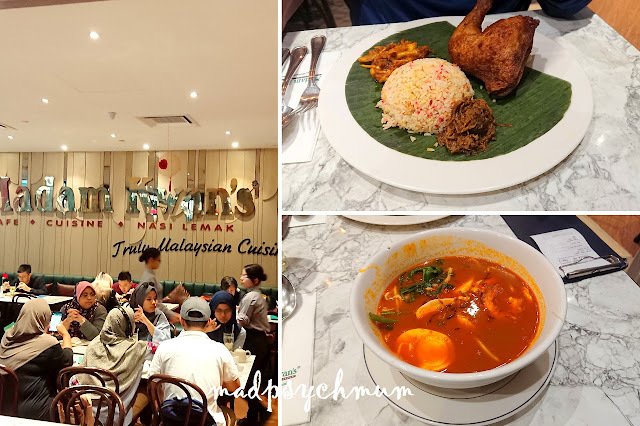 The restaurant specialises in Malaysian cuisine and we quite liked the nasi lemak and laksa that we ordered. The water was freezing cold!!! We didn't stay top long here! We spent most of our time shopping at Lot 10, Sungei Wang Plaza and Suria KLCC. 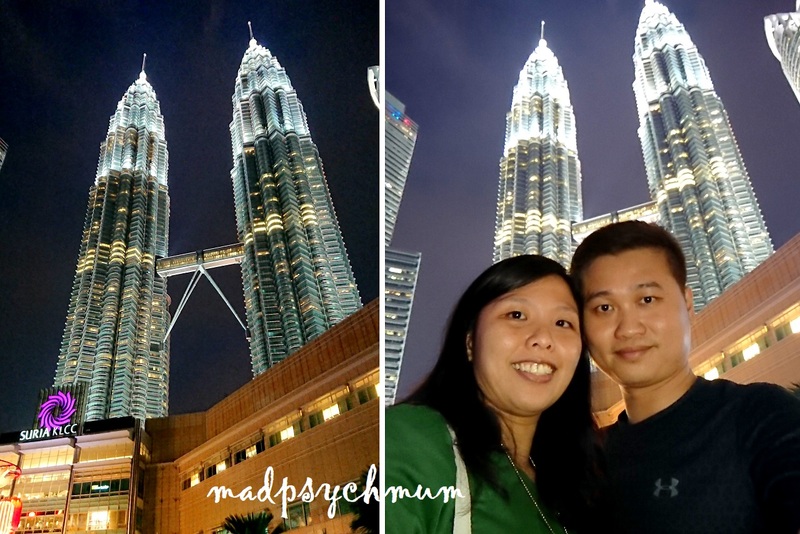 View of the Petronas Twin Towers at KLCC at night! The hubby and I also caught Thor: Ragnarok at the TGV Cinemas at Suria KLCC. We got tickets to show which was shown in a cinema with special bean bag seats! We had such a relaxing weekend away! So grateful for the opportunity! We'll definitely go on another couple trip once the boy is in Primary School!